Ready to be on Beach Time? This two-bedroom, two bath condo in Admiral's View, is a no-brainer for anyone looking for oceanfront views with the convenience of condo living. Kick back and relax on your covered porch as you watch loved ones play in the pool and listen to the relaxing sounds of the ocean just steps away. Enjoy the protection of mature dunes surrounding your 1st level unit, with hurricane shutters in place to keep the condo dry and safe during the off season. Worried about carrying luggage and groceries into your unit? No problem, this is one of the few properties with an elevator onsite. Property boasts a steady rental history between Memorial Day and Labor Day, but can also be yours to enjoy full time! 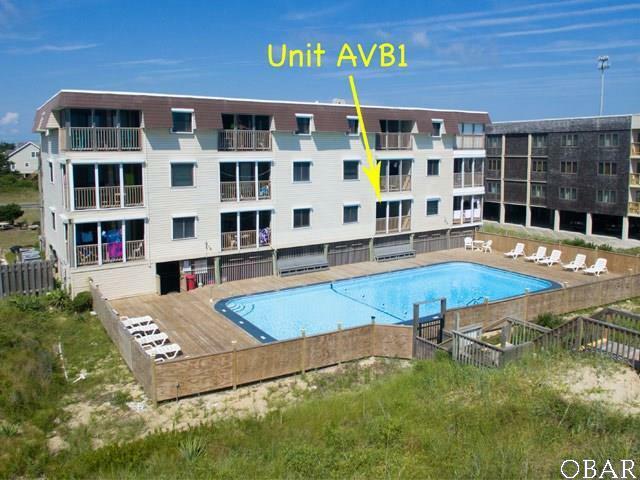 Listing courtesy of Sarah Spencer of Keller Williams - Obx.